NEWARK, N.J. -- Democratic U.S. Sen. Bob Menendez of New Jersey will kick off his re-election bid for a third term Wednesday, just two months after federal prosecutors dropped corruption charges against him. The 64-year-old Democrat announced Tuesday will hold events in his hometown of Union City, where he was once mayor, and in southern New Jersey. He'll be joined by other top Democrats including fellow Sen. Cory Booker and Gov. Phil Murphy. Menendez was charged in 2015 with trading his political influence for gifts and campaign donations from a friend. His trial ended in a hung jury last fall, and in January prosecutors decided not to retry him. He still faces a Senate ethics probe. Menendez had always said he intended to seek a third term, even when a second trial still loomed. Bob Hugin, a retired pharmaceutical executive with millions of his own money to spend, is seeking the GOP nomination. When he announced his candidacy in February, Hugin characterized himself as a fiscal conservative who will work with Democrats and disagree when needed with Republicans including President Donald Trump. He said at the time that he was "offended by Senator Menendez's actions" and that Menendez "violated the public trust." When the decision not to retry Menendez was announced Jan. 31, Menendez said the Department of Justice came to the "appropriate conclusion." He also said that he "never wavered in my innocence and my belief that justice would prevail." 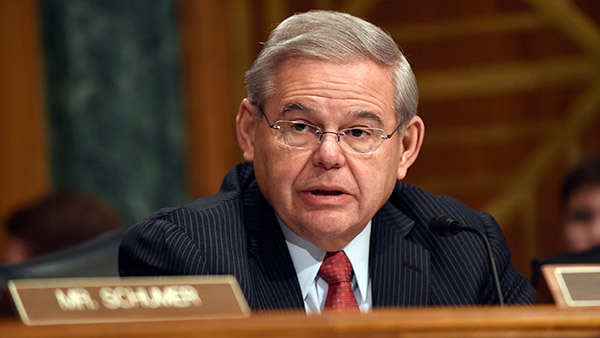 The decision came a week after a judge threw out several charges against Menendez. Jurors interviewed after the mistrial last fall said as many as 10 of 12 members of the panel had voted for acquittal. The Senate ethics probe centers on Menendez's failure to report gifts he received from longtime friend and political donor Salomon Melgen. During the first trial, federal prosecutors tried to prove the politically prominent Florida eye doctor's gifts to Menendez, which included flights on Melgen's private plane to his resort in the Dominican Republic and a luxury hotel stay in Paris, were bribes. In return, they said, Menendez interceded with Medicare officials investigating his practice, obtained visas for Melgen's foreign mistresses, and pressured the State Department to intervene in a business dispute he had with the Dominican government. Menendez and Melgen denied wrongdoing, saying the European and Dominican vacations and other gifts were tokens of their longtime friendship. Melgen received a 17-year federal prison sentence in February for stealing $73 million in one of history's largest Medicare frauds. He was also ordered to pay $42.6 million in restitution.